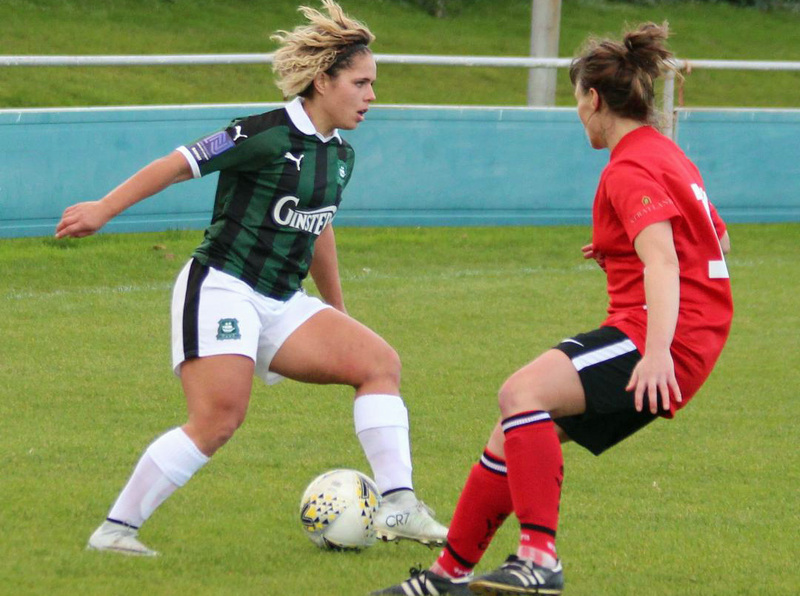 PLYMOUTH Argyle Ladies progressed into the third round of the National League Cup with a 3-1 away victory at Southampton. The Pilgrims were also delighted that teenager Jessica Jones (pictured top scoring) was declared fit to travel home after collapsing at the end of the match and being taken to hospital. The alarm was raised when joint manager Trevor Rodd went to congratulate Jones on scoring her two goals when she suddenly collapsed. The club knew immediately the seriousness of the situation and an ambulance was immediately called which took her to Southampton General Hospital. 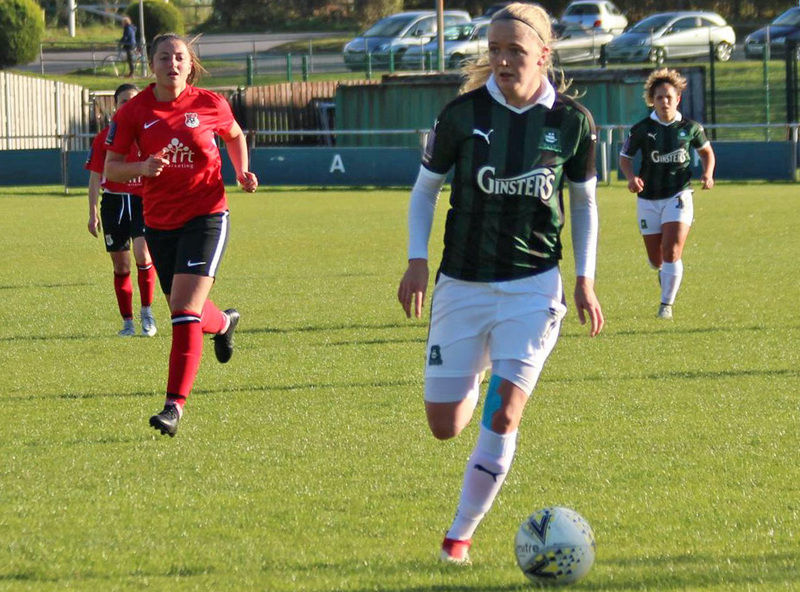 Argyle have earned a home tie against Crawley Wasps after a far from impressive performance against Southampton, who they narrowly beat to promotion last season. Argyle chose to give Cornish teenagers Faye Ivall and Tamsin Medd-Gill starting places to gain more experience. The first chance fell to Zoe Cunningham, who played a good one-two with Bleazard only to shoot narrowly over. A great touch from Cunningham then set up Jones, whose fierce low shot is well saved. Cunningham then had an effort saved, while Kate Middleton had a shot blocked from a corner. The Pilgrims were then denied taking the lead when a Southampton own goal was ruled out due to offside. 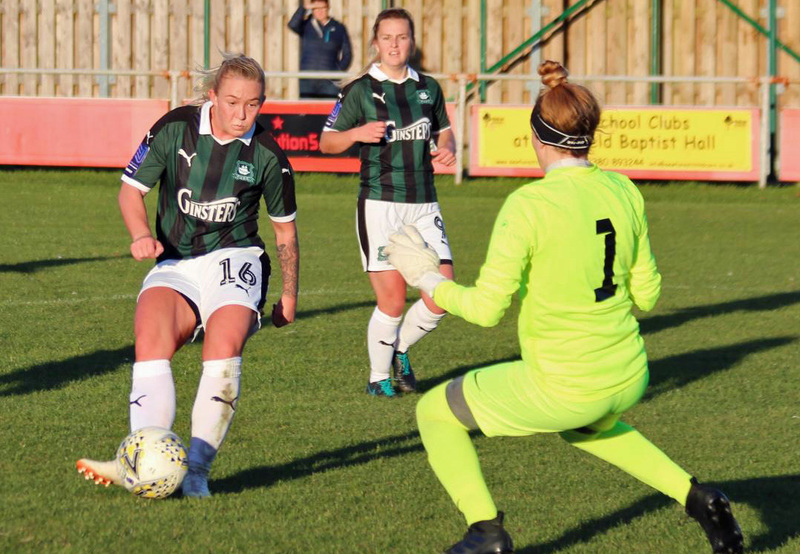 However, Argyle eventually scored the goal they needed, when in the 26th minute, Helen Bleazard raced clear to beat the goalkeeper in a one-on-one situation. Becky Dandridge almost doubled the lead but her 25-yard strike was well saved before Mollie Taylor had a good chance. Southampton did level in the second half when former Argyle player Nat Bavister netted following a goal mouth scramble. The visitors had further chances but had to wait until the 84th minute to go back in front when Lane set up Jones for a clinical finish. Jones then added a second goal a minute into added-on time after good play from Steph Beck. In the South West League Western Division, Argyle’s development team enjoyed a 2-0 home victory over Exeter & Tedburn Rangers to stay at the top of the table. Argyle’s second string could easily have beaten the bottom club by more but wasted a host of chances. Injuries and unavailability had eaten into the development team’s resources as they could only name two substitutes for the game, but both proved crucial. Bad luck and poor finishing prevented Argyle going into the half-time break with a healthy lead. Gabi Alphous went close with Sally Salter driving run from midfield ended with her shot flashing past a post. Next to try her luck was Nicola Champion who ran on to a Jodie Randall through ball ended with goalkeeper Rachel Baker making a good save. Although being nowhere near their best the home team continued to create scoring opportunities. Alex Hugh and Alphous both narrowly fired over. Probably their best move of the half saw some brilliant inter play between Becky Parkyn, Sally Salter and Alphous, who set up a shooting opportunity for Kiara Robins whose effort was blocked on the line. The second half followed the same pattern as the first with Argyle continuing to push forward but once more they could not apply a finishing touch to make the breakthrough. However, in the 80th minute they finally got the goal they had been threatening all game when a loose pass bounced towards substitute Maya Ridge, who took one glance up and sent a looping 35-yard volley over the goalkeeper and into the net. And it was the introduction of Sarah Prior that helped seal the game. Substitute goalkeeper Prior came on for the tiring Alphous and five minutes after taking the lead, a mazy run from Jodie Randall ended with a pin-point cross that Shania Fenlon headed towards goal. It looked like it effort was going wide until Prior came in at the far post to shoot home and confirm victory. Manager Rob Bonney praised Exeter & Tedburn for their stubborn resistance and really making it difficult for Argyle to break them down. He praised his team for the patience they had to show before making a breakthrough. He said: “We had to change our formation to suit the players we had available to us and we soon settled into that. It was just our poor pass selection and giving the ball away too cheaply in the first half that made it more difficult for ourselves. Saying that we still created so many chances but we were just not clinical enough in front of goal.